This article will be walking you through how to attach a standard email to a campaign, as well as looking at split tests. Split tests are useful if you want to compare features of an email you believe will perform differently when sent to different audiences. Or perhaps you wish to test how two emails compare against each other when sent to the same audience. Split tests allow you to do this. You are able to select the standard email option or split from the radio button, the standard email options is set by default. 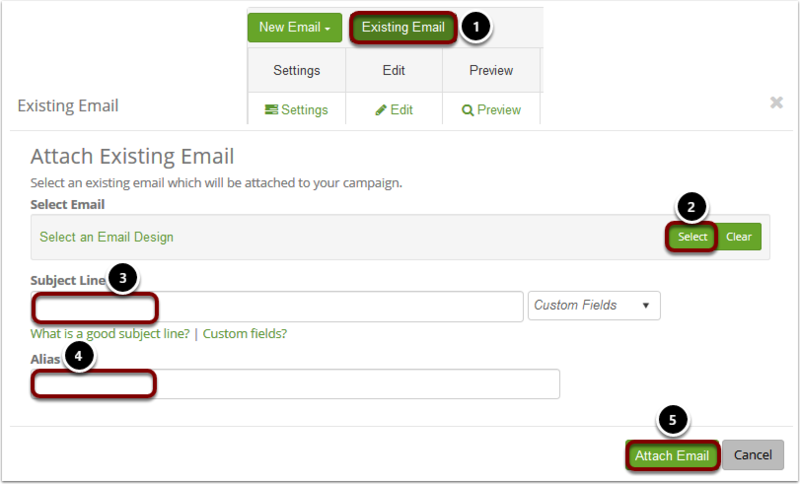 Selecting this button allows you to build your email from within campaign, this can be done via GatorCreator or the full HTML editor. Selecting this button allows you to attach an existing email. From the settings area you are able to swap the email attached, edit the subject line, edit the alias and edit the advance detail of the email attached. By selecting edit, this will allow you to edit the email attached on the campaign. This allows you to see a HTML preview of your email design. This displays the set alias for the email design. This displays the name of email design attached. This displays the set subject line of the email attached. This displays the default email attached, this is used when you attach multiple emails to the same campaign and are using selection criteria (Dynamic based email sending). This displays if an email is set as HTML or Text only. By selecting this icon you are able to select the articles you wish to display within your email, note this can only be used if you have added an article block within the attached email. By selecting this icon you are able to select the Events you wish to display, or link within your email, (note this can only be used if you have added an event block or event link within the attached email). By selecting this icon you are able to adjust the dynamic content set within the email, this can only be used if you have added a dynamic content block within the attached email. By selecting this Icon you are able to remove the attached email from the campaign. Click 'Select' and browse for your chosen email. Provide a subject line. You may also add personalisation at this stage. You can provide an alias if you do not wish the email design name to be displayed publicly within the page title. Select 'Attach Email' once finished. Clicking on 'New Email' will allow you to select the editor type of GatorCreator or GatorMail (full HTML). From here you will be re-directed to the chosen editor where you can build your email design. On saving within the chosen editor you will be re-direct back to the email tab within the campaign, as you started. 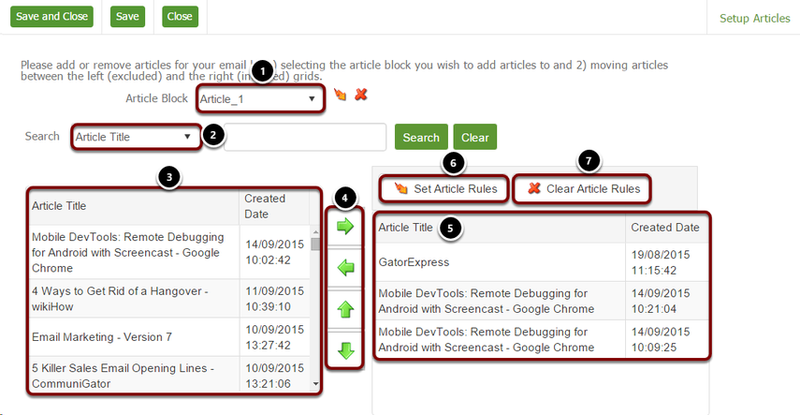 Allows you to pick the article block that you wish to use if you have multiple article blocks set up. Allows you to search either by 'Article Title' or 'Created Date'. All the articles that you have created will appear here ordered by created date newest- oldest. The arrows in the centre of the two boxes allows you to add and remove articles, and the down up and arrows allow you to change the order that the articles appear in the email. However, in order to move or make changes you need to click on the article that you want to move. The articles that will appear in your email. Allows you to create rules for each article. Allows you to clear the rule if you no longer need it in place. Split testing allows you to test two email campaigns. Attach the email that you wish to send. 'Alias 1' allows you to mask the name of the email design in the page tile that is publicly displayed, the 'Sender Alias' is what the email sender will appear as. This is the subject line used for the email send, you are able to test two different subject lines and compare the clicks/open rates to determine what design to send, to the remaining audience list. You are able to enter the number of people you wish to send to, this will split the count at point of send to 50/50. This is the percentage of the audience member that you wish to send it to, this will split the count at point of send to 50/50. Auto send, will send automatically to the remaining audience members after the split test is completed. You are able to manually select the design to send to your remaining audience members, once you have chosen the design, you will needed to initiate either design one or two (this is the recommended approach). The length of time that you wish the split test to run for. This allows you to determine the send based on the results being the highest open rate (this is only applicable on autosend). This allows you to determine the send based on the results being the highest click through (this is only applicable on autosend). For a detailed tutorial on how to create a Split Test campaign, please read the following article.